The New Humanitarian | What price the benefits of foreign investment? What price the benefits of foreign investment? 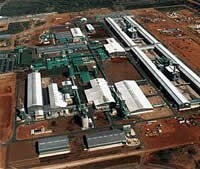 The Mozal aluminium plant is a symbol of Mozambique's red-hot economy, touted as a symbol of the investor-friendly environment that led the Wall Street Journal to declare the country "an African success story". Mozal's exports have increased Mozambique's Gross Domestic Product (GDP) by between 3.2 and 5 percent. Its output represents almost half the country's growth in manufacturing. In spite of these apparent benefits, Mozal has contributed little to the country's development. Initial investment in the project amounted to approximately 40 percent of GDP, but only created around 1,500 jobs, of which nearly a third are held by foreigners. The smelters use more electricity than the rest of Mozambique combined. The company imports most of its raw material and equipment duty-free, and enjoys an extensive list of incentives ranging from discounted electricity to a prolonged tax holiday. It also has the right to repatriate profits. The result is an isolated economic enclave that uses large quantities of scarce resources without returning revenue or jobs to the economy. A new report by the UN Development Programme's (UNDP) International Poverty Centre, based in Brazil, is highly critical of encouraging mega-projects like Mozal as a development strategy. The September 2007 study examined poverty, inequality and growth since Mozambique instituted economic reforms in 1992, at the end of the civil war. It found that Mozambique's indices of rapid economic growth were illusory at best. Although the economy grew by 7.9 percent last year, most of the growth in income and consumption occurred among the population's richest quintile, with less than 10 percent of growth affecting the country's poorest. In the United Nations 2007/2008 Human Development Index, the country ranked 172 out of 177 countries listed. The UNDP study interpreted this inequality as a failure in development strategy, which has focused on industry over agriculture. "Growth in industrial production has been the main driving force behind Mozambique's rapidly growing exports," the study's authors observed. "Based on a few mega-projects, this growth has, however, created few jobs, while its contribution to public revenue has been marginal when compared to its value of production." The report pointed out that the southern provinces receiving the greatest percentages of foreign direct investment also saw the largest increases in poverty rates in recent years. Development strategies implemented since the end of the civil war neglected agriculture and fishing, the primary source of livelihood of more than 80 percent of Mozambicans. "Growth [in agriculture] represents only a 'bounce-back' to pre-war levels of agricultural production without any substantial improvement in productivity, which remains low even when compared regionally," said the UNDP. The study suggests that dependence on large projects, coupled with Mozambique's already heavy dependence on foreign aid, means top officials are more concerned with accountability to donors and financial institutions than the people they were elected to serve. The authors concluded that the result was not "pro poor". "Following in the footsteps of the centralised colonial administration and the subsequent Marxist-Leninist party/state apparatus, the government continues to operate, through mega-projects put together by the top political leadership and respective donors and/or private investors, with very little public consultation or transparency," the study noted. For some analysts the problem is not that mega-projects are not pro-poor, but rather that they are poorly managed. Carlos Castel-Branco, an economist at Mozambique's Institute of Social Studies and Economics, said the problem was the extensive tax breaks that mega-projects received. "In 2006 the International Monetary Fund declared that mega-projects are irrelevant to poverty reduction. I don't agree: under the current circumstances that is true, but through the creation of tax linkages they can make a big impact," he said. Most mega-projects in Mozambique were not "footloose". Investors chose to locate in the country for strategic reasons and did not need tax incentives to attract them. Nonetheless, they enjoy a wide range of tax breaks and benefits that limit their impact on Mozambique's economy. According to Castel-Branco, the project is not the culprit, the development strategy is. "Imports from mega-projects represent 50 percent of all imports, but they have no impact on fiscal revenue - Mozal pays a one percent tax on sales," he pointed out. "If Mozal paid one-third of the normal tax rate for firms, our state budget could increase by 50 percent. If all mega-projects paid that rate the state budget would double." If Mozambique were to tax mega-projects at discounted rates instead of offering tax holidays, the government could reduce budget dependency on foreign aid to almost zero. Alternatively, it could continue the flow of aid but expand expenditure on social or industrial development. Castel-Branco claims the government has seen its mistake but has diminished its power to negotiate by granting tax incentives in the first place. "The UNDP should work a little bit on issues like this," he said. "It's difficult for Mozambique to do it on its own; the World Bank, the IMF, need to say, 'look, we need to change this situation'. The United Nations has the moral authority. It's possible to renegotiate."